Sigma Mixers are relatively power-intensive, slow speed mixers. 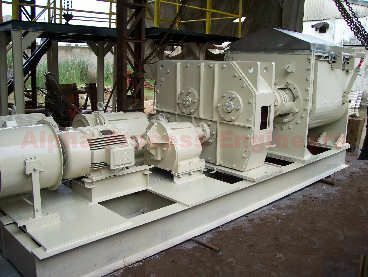 These mixers have a twin-blade configuration which rotate in opposing directions, either tangentially or with a certain amount of overlap. Custom-built designs are also offered in tilting for top discharge, to suit specific application needs. We have in-built technical design strength and manufacturing expertise to offer the very best in Mixing machines to suit any, repeat any, application. Sigma Mixers are ideally suited in the manufacturing operations of Foodstuffs (Chocolates, Biscuits etc. ), Ceramics, Plastics, Friction Compound, Chemicals, Abrasives, etc.